Selected for the National Film Registry in 2008, Lionel Rogosin's On the Bowery is a seminal work of documentary filmmaking. Presented on DVD and blu-ray for the first time by Milestone Films, from a restoration by Cineteca del Comune di Bologna, On the Bowery is a remarkable film, from an aesthetic as well as a historical standpoint. The film was nominated for an Academy Award in 1958, but in subsequent years has not only faded from the public consciousness, but from critical consciousness as well. One person for whom it made a huge impact, however, was Martin Scorsese, who provides a video introduction for this new release. Watching the film now, it's easy to see why it so spoke to Scorsese, and also just how important it is to the history of documentary filmmaking. Calling it a documentary as actually a bit of misnomer, as parts of it are clearly staged, albeit by nonprofessional actors. But that doesn't hamper its authenticity, which is consistently raw and immediate. 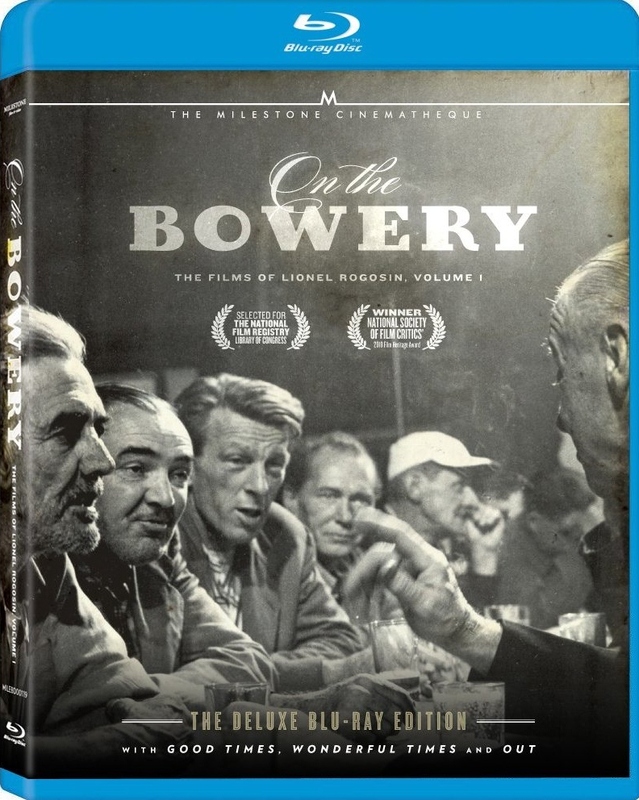 The film centers around New York's Bowery, home to drunkards, thieves, and hardscabble men just trying to get by in the world. Poverty is keenly felt here, and many of its citizens are just passing through on their way to another job in some other far flung corner of the country. One such drifter is Ray, a transient railroad worker just looking for an honest days work. The film follows him as he navigates the bowery, from having drinks with new acquaintances in a bar, to getting robbed after passing out on the street, to finding (or not finding) a new job. Rogosin's camera lingers on the craggy, careworn faces of the Bowery's disparate citizens, exploring the streets and alleys with a roving, unblinking eye. While parts of the film were scripted it maintains an immediate, unflinching honesty. Rogosin was inspired by the cinema verite and neo-realist styles coming out of Europe, and he spent a great deal of time on the Bowery, getting to know the men and even living their life alongside them. 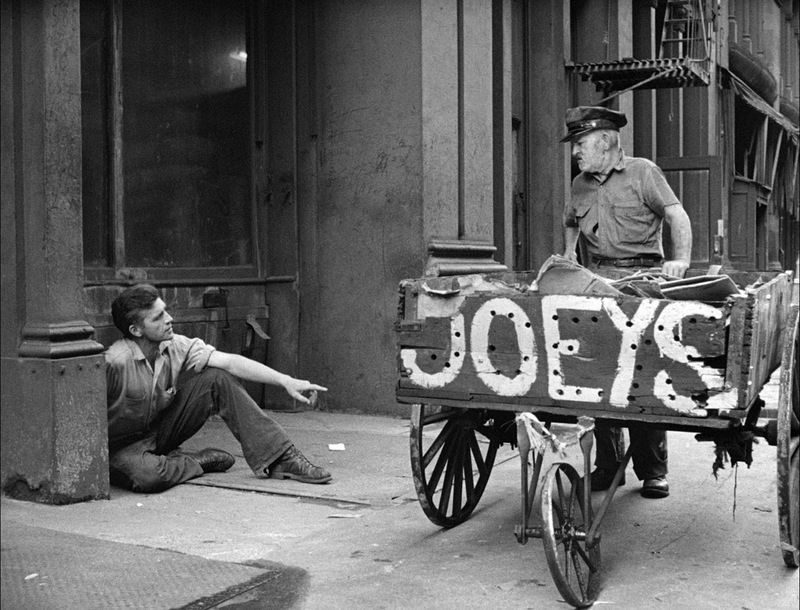 It's that familiarity that gives On the Bowery its power of authenticity. It feels real, even amid the sometimes awkward non-professional performances. Rogosin masterfully tells the untold stories of the people society left behind, and Ray makes a fantastic "everyman" character, his non-expressive face serving as a kind of blank canvas. He isn't so much an individual as he is a representative of an entire class of honest men (many of whom were veterans) just looking for honest work in the years following World War II and the Korean War. The aftermath of war was clearly something very close to Rogosin's heart, and comes to the fore in his 1966 documentary, Good Times, Wonderful Times, which is also included in Milestone's blu-ray set. Completely rooted in the counterculture of the 1960s, for good or ill, depending on your point of view, Good Times, Wonderful Times is a much more overtly political work than On the Bowery. 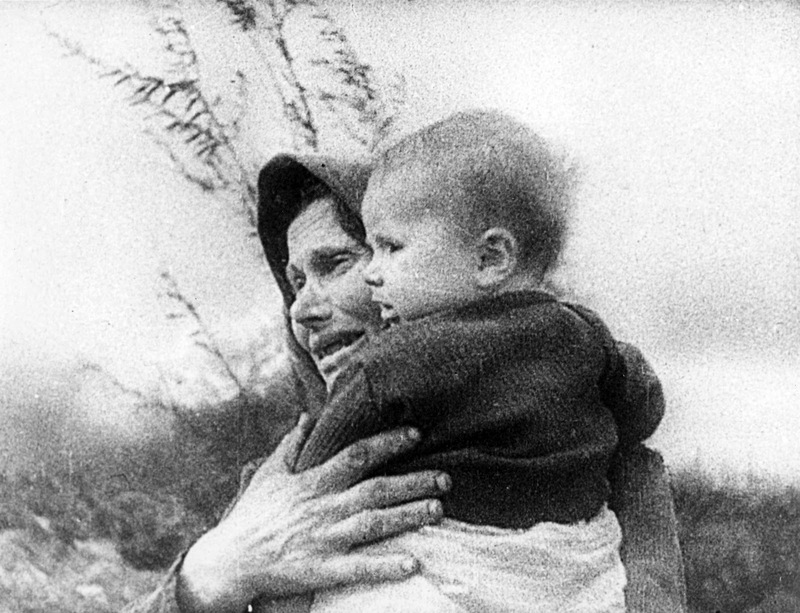 Juxtaposing the ramblings of the faux-intellectual, effete bourgeoisie with images of wartime atrocities, the film paints a grim picture of the disconnect between the upper classes and the real world. It clearly wears its anti-war heart on its sleeve, but in some ways its naivete as well. While the party-goers it follows certainly say some reprehensible things, Rogosin falters somewhat when he tries to compare any army with fascism, missing the fact that it is because of people like Hitler that armies are a necessary evil. But what it lacks in nuance it makes up for in sheer conviction. The film may be flawed in its ideological zeal but it's undeniably thought provoking , which was the whole point to begin with. Rogosin often paints with as broad and as black and white a brush as his subjects do, but he does it with great power and skill. Milestone's presentation is a veritable treasure trove for film historians, with a wealth of Criterion level extras. This is a fine set indeed, and the folks at Milestone have outdone themselves, not only with the sumptuous extras (which also include Rogosin's short film, Out, and in-depth looks at the making of the film), but in the impressive HD transfers of these films, which are as flawless as they can be without compromising their scrappy personalities. From the hard scrabble streets of New York to the Jewish ghettos of WWII, Rogosin's films take us on a tour of hard knock reality with a striking eye for time and place rarely equaled in documentary filmmaking. Rogosin redifined the boundaries of the medium and in the process laid down a definitive history of not only New York, but of America itself. In short - On the Bowery is something quite special indeed. Now available on blu-ray and DVD from Milestone Films.